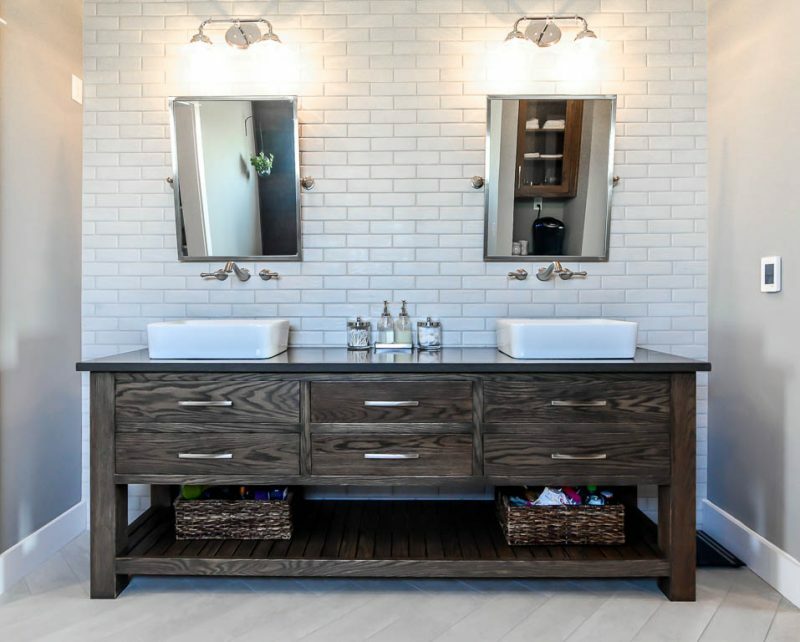 Rustic modern bathroomA bathroom remodel project can come close to breaking the bank, so it is always a good idea to look at timeless finishes that will withstand the changing trends in order to best stretch your dollar. The best option for any bathroom remodel is to keep lines clean, colors light and use quality stone finishes where you can. In a bathroom, it is always a good idea to keep to straight lines as opposed to odd angles or crazy tile configurations. Steer clear, if you can, of corner tubs or angled showers, which can make a space look dated. A classic tile design that has withstood the test of time in homes across the ages is subway tile. Of course you can modernize the subway tile feel, with bigger tile pieces, but the subway tile design is a very simple way to keep lines clean while adding visual interest to your new bathroom. Mosaic tiles are fairly popular right now and can be easily found in most home improvement stores. A word of caution for anyone looking at mosaic tiles in their bathroom, use sparingly and in places the can be easily replaced if in five years it is not really working with the current trends. Steer clear of trendy finishes like colored glass or metals, and opt for classic geometrics like hexagons, over ultra modern designs like cubes. If you are a bold person and tend to lean towards having a lot of color in your home, consider dialing back on your bathroom a bit. Instead of painting cabinets and walls in bold colors, consider keeping those spaces neutral, opting to add your love for color in linens and accessories. When in doubt about bathroom color options you cannot go wrong with simple black and white. It’s always a good idea to keep cabinets a light color, either as a wood finish or painted white. Black finishes are great for door hardware, faucets, light fixtures and towel hooks. If you absolutely have to have a punch of color in your bath a great compromise is painting an accent wall or giving an easy to remove renter’s wallpaper a try. You can find all kinds of styles and colors available online. In the spirit of keeping things classic, think marble. Instead of the real deal, though, it may be worth looking at a less porous marble option. True marble can absorb the acids in soaps, shampoo and other cosmetics causing it to discolor or stain. However, there are sealers available for marble surfaces that can be applied every six months to a year that can help with the wear and tear. A light granite or a quartz countertop are also great options. Again the idea is keeping things clean and light, so shop for the brighter versions of these natural stones to achieve that look. These options might seem a bit pricey on the front end, however, there definitely needs to be a budget set aside just for stone in your bathroom. Why? Because it offers the most bang for your buck. Not only in style, but more importantly in durability. Bathroom surfaces see a lot of wear and tear, it just makes sense to invest in a quality material where it is most needed, and that is the countertops. A bathroom countertop sees the most action more than any other surface in a bathroom. If budget is an issue, opt for less expensive tile in the shower or on the floor, but don’t skimp on your countertops or sinks. You will thank yourself several years later when the countertops still look brand new.